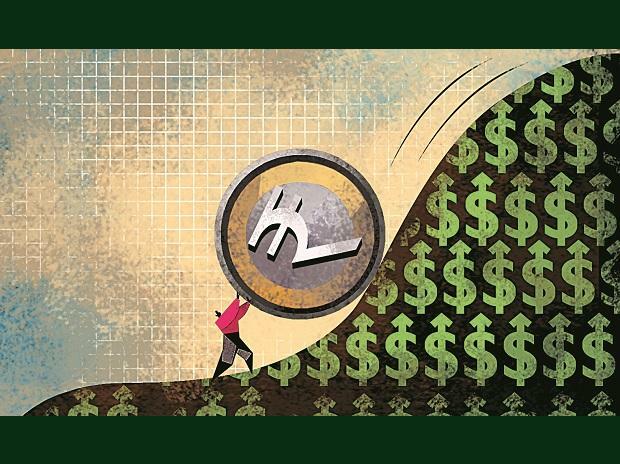 With the rupee hitting a fresh low, the government Tuesday said the currency will stabilise on its own as there are no domestic factors contributing to this depreciation. The rupee hit a life low of Rs 71.57 to a US dollar earlier on Tuesday, making imports costlier and putting price pressures. "Rupee has depreciated primarily on trade war fears and rise in global crude oil prices. The government does not have control over these...so there is only so much we can do," a top official in the finance minister, who wished not to be identified, said. The currency, he said, "will stabilise on its own as there are no domestic factors that contribute to this depreciation". However, this could widen the current account deficit as India would have to pay higher for its oil imports. The country is 81 per cent dependent on imports to meet its oil needs. Credit rating agency Moody's Investors Service last week said there are risks of India breaching the 3.3 per cent fiscal deficit target for the current financial year as higher oil prices will add to short-term fiscal pressures. The current account deficit (CAD), which is the difference between inflow and outflow of foreign currency, will widen but will not jeopardise India's external position; and the gap will remain significantly narrower than five years ago. The government has budgeted fiscal deficit to be at 3.3 per cent of gross domestic product (GDP) in the current fiscal ending March 2019. Fiscal deficit during April-June quarter of current fiscal had touched 68.7 per cent of Budget estimates. Anis Chakravarty, Lead Economist and Partner, Deloitte India, said the depreciation is in line with emerging market exchange rates which was largely fed in through dollar strength. "A divergence between US dollar appreciation and a moderation in euro may have amplified the dollar strength, an effect of which reinforced rupee depreciation. Apart from the recent elevation in prices and input costs, other factors leading to rupee weakening include continuing global trade disputes," he said. SBI group chief economic adviser Soumya Kanti Ghosh said the rupee has now depreciated by 6.2 per cent since June when the RBI started hiking rates. Rushabh Maru, Research Analyst at Anand Rathi Shares and Stock Brokers, said the rupee continues to make a new record low on account of the crisis in the emerging market currencies. Also, consistent rise in the crude oil prices and dollar index has kept sentiments bearish. "There are talks of rupee moving towards 72-73 levels," he said. "There are talks of out-of-the-monetary-policy interest rate hike by the RBI and issuance of NRI bond issue to raise dollar money. However, at present the possibility of both the options is very low as the macroeconomic situation is much better than it was in 2013.